So when I said last week I was super-busy with work and other terrible non-comic things and would have a blog post next week, I of course didn’t meant this week. I meant next-next week. Have some much needed time off coming up, so I can recharge my batteries, put more time into the comics, and play some games. 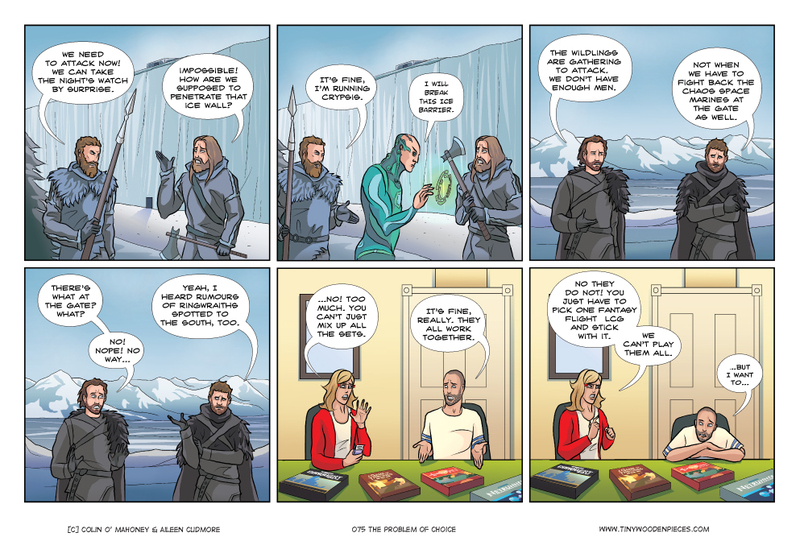 Netrunner, Game of Thrones, W40K: Conquest and Lord of the Rings? Did i get them all right? 🙂 I haven’t played any LCG yet. Netrunner and LOTR look fun, though Netrunner could be hard to master and keep up with, but i love cyberpunk theme. Would be glad to try LOTR someday. I really liked WatchItPlayed gameplay video of it. On the mixing part. Hm.. Why limit yourself just to LCGs? How about mixing resource collection and building of Catan with some troops from Battlelore marching and devastating opponents’ cities. Or it is not the robber moving when you roll six, but the almighty… Cthulhu.. muahahaha. If he gets you, you just lose the game, that’s it. I’ve mostly avoided collectible card games, because I have neither the time or the money to invest in them. Additionally, a lot of the games are 2 player, which doesn’t happen all that much either…. At our game group on Wednesday we played Mammut, an interesting game from the designer of Escape: The Curse of the Temple (that I got free when I backed the Escape Big Box Kickstarter), and Exploding Kittens. I think that probably says something about me…. I like Mammut a lot more than I thought I would. At the centre is the unique (at least in my collection) mechanic of dropping all these tiles and then each player takes either as many as they like from the middle, or *all* of another players tiles (returning at least 1 to the centre). A kind of “you cut, I choose” mechanic. You then gain (or lose) points across a number of different criteria of varying styles (least fire tiles loses 5 points, each tusk tile is worth 2 points, most meat tiles gets 8 points, etc, including a “fur track” which you move around, and each round the player with the most fur gains points and the least loses points). A kind of points salad, I guess, but quite thematic and there’s a definite balance to try and keep your hand in all the different ways of getting points. You play 5 rounds. At the end of the final scoring, you score extra points for each of the different animals you have collected across the rounds (they score nothing during the round, but if you get all 7 it’s worth something like 30 points, which can easily win you the game). I’m glossing over some of the details, but you get the idea. It’s a Euro-style game at heart, but at the same time there’s a reasonable amount of interaction in the first tile-collection phase, and you’re definitely trying to prevent people from scoring too highly in their tiles. So will Tiny Wooden Pieces be at Gaelcon? No plans to do cons at the moment, but it’s definitely something we want to look at, maybe next year? Would really love to get to meet readers and play some games with them. Lately I’ve mostly been playing my own game designs. Just started designing games in March and am currently testing my second and third designs whenever I can find willing testers. Nice! Hope that works out for you. In two years you will get to add Legend of the Five Rings to that list of Fantasy Flight LCGs. As for what I am playing, tomorrow is going to be a day filled with Pathfinder ACG and the Sunday is going to be to play as many of my unplayed games as possible. Heard about the L5R news just too late to put it into the script. Pathfnder is one of those games I keep hearing about but have yet to have a chance to play. Never played the RPG though, so I don’t have any investment in its world. Never played the RPG either, but I loved playing video game RPGs and the Pathfinder ACG along with Descent scratches that RPG itch nicely. I play D&D as well but that is more social experience than game to me. What’s somewhat ironic to me is that I’ve long thought the L5R game engine pretty accurately captured the feel of GoT in a lot of ways (wars, honor, there’s even a great wall to keep out monsters) and was always bothered there wasn’t some effort to get the two to cross. Then the recent announcement came… and the excuses for keeping them apart fall by the wayside. Well, last night we played Sea Tsuro, Rock Paper Scissors (with Zombies), and Galactic Emporor (aka Twilight Emperium light). Having only recently played TI itself I kept thinking that the board looked so damn tiny. You should play… um… stuff. Fun game stuff. Galaxy Trucker! Sure you can be in our “gang” (or you could just call it a club). But I fear it’s a little far for you to travel. A game that’s a light version of TI? I must investigate. I love Eclipse, which kind of falls into that same category, but have never managed an actual game of TI. Someday soon, I hope. I’ll consider myself an honorary member of your gang then 🙂 Is there a cool secret handshake? It only takes about 4 hours instead of 10-12, of course it’s not nearly as detailed or snazzy. But if you want to play TI you need a whole damn day and a good (and patient) group of friends to play it. If there’s a handshake it’s so secret I don’t even know about it. No Star Wars, Call of Cthulhu, L5R, Warhammer Invasion… This is the problem! Also while researching the comic Aileen discovered the LOTR LCG was cooperative and she’s been talking about wanting to play it ever since. Would it be gauche to mention that we’re trying to kickstart an LCG that does exactly this?